Membership in the military and eco­nomic Tri­par­tite Pact was expanded by new pro­to­cols signed less than two months later, which added Hun­gary, Roma­nia, and Slo­vakia, which was a German client state in what had been the east­ern half of Czecho­slo­vakia. (The Germans had over­run the western half of Czecho­slo­vakia in March 1939, con­verting it into the so-called Protec­tor­ate of Bohe­mia and Moravia cen­tered on the Czech capital of Prague.) Bul­ga­ria and Ger­man-occupied Yugo­sla­via joined the following March, 1941, and Croatia in June of the same year. From Japan’s point of view, the Tri­par­tite Pact gave cover to its ex­pan­sionist actions and designs in “Greater East Asia”; namely, China, where it had been at war since 1937; French Indo­china (present-day Viet­nam, Laos, and Cam­bodia); British Malaya, Borneo, and Burma; and the Dutch East Indies (now Indo­ne­sia). Less than a week before Japan joined the pact, the French col­lab­ora­tionist Vichy govern­ment headed by Philippe Pétain had inked an agree­ment to allow Japa­nese forces to use three air­fields in North­ern Indo­china and to main­tain a 6,000-man gar­ri­son there. At the time of its original signing, Japan said that the Tri­par­tite Pact in and of itself was not “hostile” to the United States. Two months later, on this date, Decem­ber 9, 1940, Japan’s foreign minis­ter, Yōsuke Matsu­oka, stressed that Japan’s alli­ance with the prin­ci­pal Axis power, Germany, was not intended to threaten U.S. interests over­seas and that Japan would not fight the U.S. unless the U.S. acted as the aggressor. By the summer of 1941, how­ever, Amer­i­can code-breakers and the poli­tical and mili­tary leader­ship in Wash­ing­ton knew from reading Japa­nese Foreign Minis­try dispatches (so-called “Purple” inter­cepts usually solved and trans­lated into English within hours) that war between Japan and the U.S. was inevi­ta­ble. It was just a matter of time before Japan would become the aggressor. 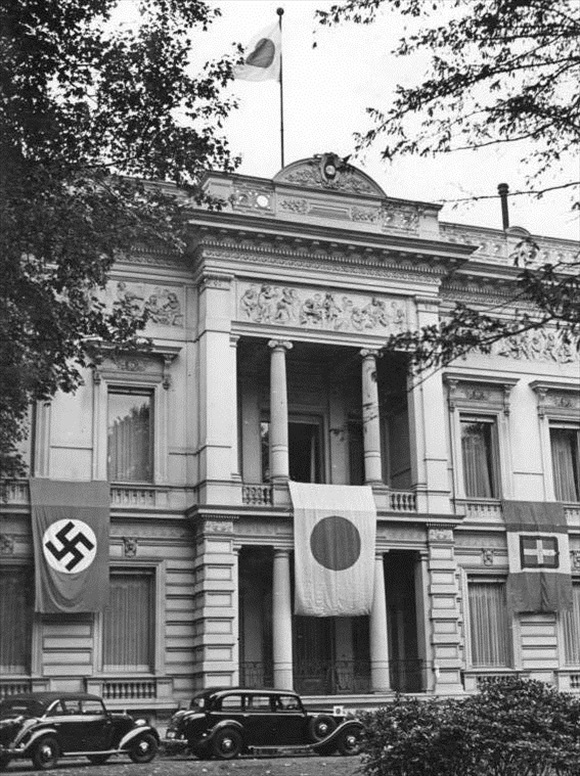 Above: Japanese embassy in Berlin clad in flags of the three Tripar­tite (Axis) Pact signa­tories in Septem­ber 1940. At their zenith during World War II, the Tripartite powers presided over empires that occupied large parts of Europe, Africa, Asia, and the islands of the Pacific Ocean. The war ended in 1945 with the defeat of the Axis powers and the dissolution of their alliance and empires. 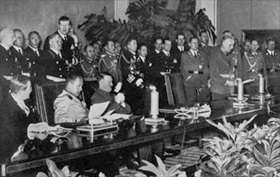 Left: On September 27, 1940, the Axis Powers (namely, Germany and Italy) grew by one when Japa­nese ambas­sa­dor Saburō Kurusu (left, leaning forward in photo­graph), Italian foreign minis­ter Galeazzo Ciano (to Kurusu’s left), and German foreign minis­ter Joachim von Rib­ben­trop (addressing guests at podium at right) signed the three-way Tripar­tite Pact. Adolf Hitler (slumped in chair) wit­nessed the gala pro­ceedings. Ameri­cans know Saburō Kurusu as Japan’s “special envoy” to Washington who, along with Japa­nese am­bas­sa­dor Kichisaburō Nomura in Novem­ber and Decem­ber 1941, tried to nego­ti­ate out­standing differ­ences with the Roose­velt adminis­tra­tion over its support for Nation­alist China and its frozen trade rela­tions with Japan while that coun­try was secretly pre­paring the attack on U.S. mili­tary in­stal­la­tions at Pearl Harbor, Hawaii. Neither Kurusu, Japan’s ambas­sador to Germany from 1939 to Febru­ary 1941, nor Nomura, a retired ad­miral and former foreign minis­ter (1939–1940), was tried after the war for their role in the lead-up to Pearl Harbor. 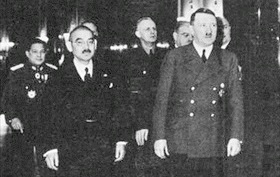 Right: Yōsuke Matsuoka (1880–1946), Japanese foreign minister between July 1940 and July 1941, paid a visit to Hitler in Berlin in March 1941. In the back­ground between Matsu­oka and Hitler is German foreign minis­ter Rib­ben­trop. Matsu­oka, who in 1933 led Japan’s walk­out of the League of Nations, which objected to Japan’s seizure of North­east China, was a major advo­cate of Japan’s alli­ance with Germany and Italy, whose assis­tance he saw as a per­fect balancing force against U.S. inter­ests in the Asia Pacific region. Curiously, following the out­break of war between Japan and the U.S., Matsu­oka was quoted as saying, “Entering into the Tripar­tite Pact was the mis­take of my life.” By asso­ci­ating it­self with the likes of Hitler and Musso­lini, Japan gained negli­gi­ble bene­fits while it alie­nated the leading West­ern powers. After Japan’s defeat in 1945, Matsu­oka was arrested and held at Sugamo Prison near Tokyo, where he died prior to his trial on war crimes charges before the International Military Tribunal for the Far East (Tokyo Trials).